Yes, we ship to most countries all over the world. See our Shipping Information page for all the shipping methods available. We have a system that allows you to track your order and shipment status. You need to fill in your Order ID number and the email address you used when placing your order. You can go to our tracking page here. How can I find my purchase on my billing statement? What payment methods are available on your website? We accept all major credit cards and payments made through PayPal. You can see the complete list of payment methods on our payment page, after clicking on the "Proceed to Checkout" button on the shopping cart and selecting your country. Respecting your privacy is of utmost importance to us at MyNameNecklace. Any information you submit to our website, or that is gathered by a “cookie” during your visit, is used strictly by MyNameNecklace to maintain a record of your purchases and for promotional reasons. We do not sell, transfer, rent or trade your information to any third party. When you register at our site, you will be asked to submit some personal information, such as name and contact information. MyNameNecklace will safeguard your personal information. Under no circumstances will we disclose or share your information with any unauthorized third party. In addition, we utilize a “cookie” to track your movements on the site. The cookie “remembers” who you are, therefore eliminating the need for you to re-register with us every time you visit our site. In addition, it enables us to provide you with a shopping cart feature, and streamlines your overall shopping experience. 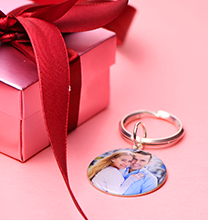 If you have a MyNameNecklace promotional code, enter the code in the “Promotional Code” box on the bottom of the shopping and click on “Apply”. I have a PayPal account but I cannot complete the payment. If for some reason you cannot complete your payment using PayPal, please contact us with your order details. We will send you an e-mail with a PayPal Payment Request in order to complete your payment. Placing an order is easy. Choose the piece of jewellery and write the desired inscription. Select the chain length from the drop box menu and click on the "Add to Cart" button. In the shopping cart you can add a gift box and gift card message. You then select the shipping option you would like in the “Shipping Method” box in the shopping cart. Click on "Proceed to Checkout" or the "Checkout with PayPal" button to complete your purchase. You will be directed to the selected secure payment-processing website. There you will have the option of paying with your credit card, PayPal or a bank transfer. I have a special request for my necklace, what should I do? You can add your special requests in the 'Comments' box at the bottom of your Shopping Cart. We will make sure that your order is carried out according to your preference. If you are unsure whether your special request is possible, please contact us. How do I change an order after It has been placed? Once your order has been submitted we will immediately begin production on the items. Due to the fact that each item is unique and customized, you will be refunded a 70% of the original item price as it cannot be restocked. If you have any question about canceling your order do no hesitate to contact us. Once your order has been submitted we will immediately begin production of the items. Once your order has been submitted we will immediately begin production on the items. If you would like to cancel your purchase, your order is subject to a 30% restocking fee. This cancellation policy does not apply to solid gold items. For cancellation of solid gold items, please contact us immediately. Why didn't I get order and shipping confirmation emails? After placing an order you will receive an “Order Confirmation” email with all your order details. We ask you to review your items and shipment address. Therefore, it is important to provide us with a valid email address. If you didn’t receive a confirmation email, please check your spam box. To ensure that our emails do not go to your spam/junk folder, add CustServ@MyNameNecklace.co.uk to your email address list. You can find out your Order Status here: Order and Shipment Status Information. How can I preview my necklace? Our most popular models have a preview feature. What chain length should I select? See our Chain Length Guide to help you decide. Does the chain length include the pendant? The chain length does not include length of pendant. Please visit our chain length guide to choose your desired chain lenght. How big is the pendant or name plate? The pendant height is written in the product information table on the product page. The pedant length varies according to the inscription. The average size of a name plate ranges from 0.75"–2" (2cm–5cm). For smaller name necklaces, the size of an average name plate is 0.7"-1.5" (2cm-4cm). For all other jewellery, the size is published in the information box on each product page. When should I order double thick items? For names that include more than 8 characters, we always recommend to order a pendant in double thickness. This will cause the pendant to be more stable and durable. You may also choose double thickness material for shorter names. 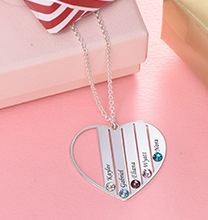 How can I add a Birthstone crystal or a diamond to my necklace? We can add Birthstone crystals or a diamond to most products. Please take a look at our Birthstone and Diamond collections. Please contact us for more information or special requests. Where do you set a Birthstone crystal or a diamond on the pendant? For names that include the letter "i", we will set the stone on the dot of the "i". For names that do not include the letter "i", we will set the stone on the first letter of the name unless specified otherwise. If you would like to set the stone on a different character, please indicate that in the comments box in the shopping cart. How can I order a double-barrelled name, or name/word with two capitals? Double-barreled names or words usually have more than 8 characters. 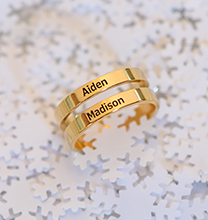 We recommend ordering double-barreled names or words in double thickness material to make your necklace more durable. Please visit our double thickness material collection here. 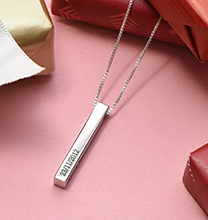 How can I order necklace with special characters (numbers, punctuation marks)? You can enter all special characters when placing your order. Feel free to contact us for any other request. Can I order my necklace in other languages than English? Please check out our World Collection to see jewellery in additional languages. See our Ring Size Guide for more information. 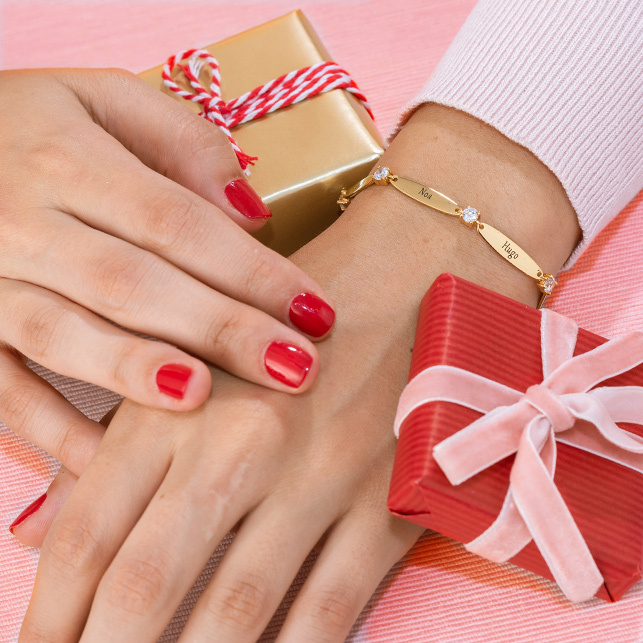 Is your jewellery made of real precious metals? Yes, all our precious metals are purchased from government certified vendors and are marked for authenticity. We use only 0.925 Sterling Silver. Our gold items are made of solid gold. Gold purity level is indicated on the product (9k, 10k, 14k or 18k). All our products are 100% nickel-free, except for our white gold products. What chain type comes with my necklace or bracelet? Box Chain, Rollo Chain, Bead Chain and Figaro Chain. Twist Chain, Box Chain and Rollo Chain. Bead Chain and Twist Chain. For our Acrylic items we offer a Sterling Silver Plated Metal Rollo Chain and a 18k Yellow Gold Plated Metal Rollo chain. Do you offer gift wrap and gift message? Yes, you can add a gift box and a gift message card in the gift box page or add them in the shopping cart. How can I preview my monogram? You can preview what your Monogram will look like on our Preview Page. Can I order a monogram with more or less than 3 letters? Yes, your monogram necklace does not have to be confined to only 3 letters. You can see sample photos of one and two monogram necklace here: Sterling Silver Monogram Necklace. You can wear your name in its full glory with this product Vintage Monogram Style Name Necklace. Or if you like a minimalistic approach, it is also possible to customize your pendant with a single or two initials as well. What size of Monograms do you have? We offer three different sizes of Monogram necklaces suitable to your special preference. Circle Sterling Silver Monogram Necklace offers a subtle and petite look. Our best-selling Sterling Silver Monogram Necklace is medium-sized and fits every wearer perfectly. To make a memorable impression, try our XXL Statement Monogram Necklace, which is 2 inches height. Please check out our Monogram Collection to see various materials on offer. Are there any other characters available for customised monograms, besides the letters A-Z? We can include numbers and punctuations in Monogram pendants. 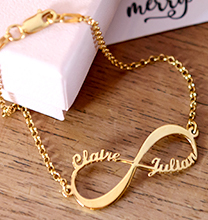 However, it is more advisable to customize your necklace only with initials as the numbers and punctuations will not be stylized with our Monogram font. How do I order a monogram necklace / bracelet / earrings? You may return most new, unopened items purchased and received from MyNameNecklace.com within 100 days of delivery. You can find our full return and cancellation policy here. I’m interested in selling your jewellery, who should I contact? For wholesale information visit our wholesale page. You may also contact us for all your requests. How do I become a MyNameNecklace affiliate? Visit our affiliate page for more information. If your question is not listed here, please feel free to contact us.